I had a marvy day and despite spending the entire day looking rather, well… makeup-less, I did put some effort into making my nails as bling-tastic as possible! Wanna see? What with it being in focus n’ all, you don’t really get the true OMGGLITTERYGOODNESS effect. But trust me, it was super blinging! 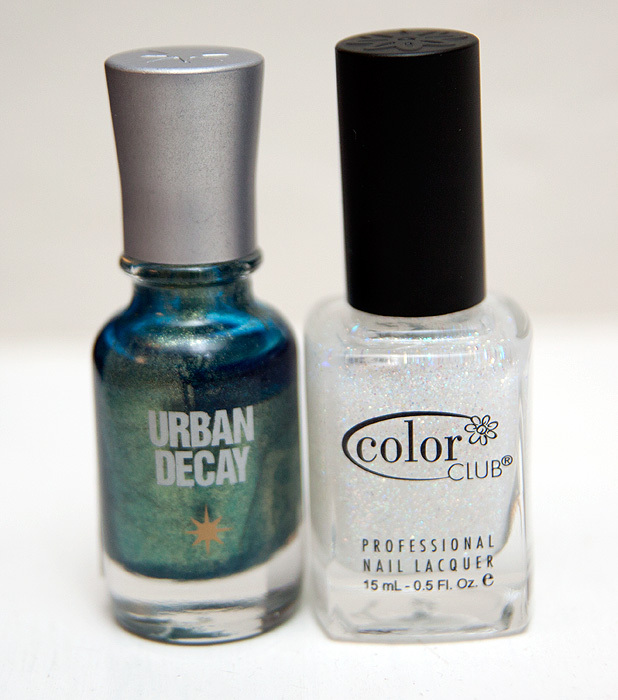 I used two polishes… one was an Urban Decay oldie from my youth (ok, 5 years ago) called Cult and the other was my brand new Color Club spangly holographic top coat called Starry Temptress. Do you have any favourite combos for the ultimate in nail bling? This is very pretty! I really want Cult, it’s quite lovely on you. Happy birthday! That looks amazing! I will have to look into that Color club polish. 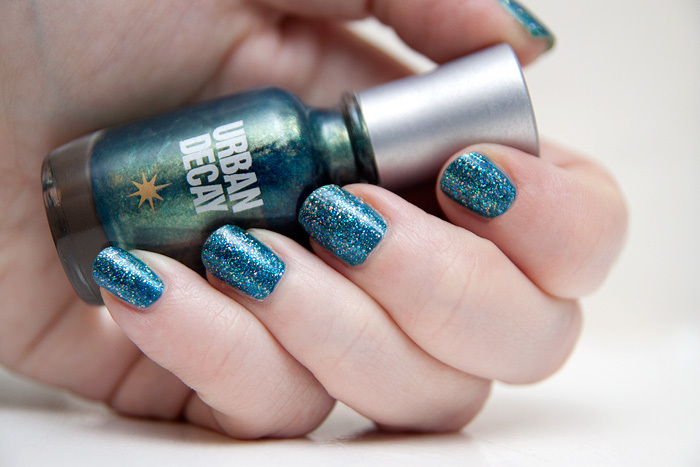 I have some old UD polishes that I found reduced in Superdrug a few years back – love them! Oooh that looks super pretty! They look stunning – glittery, metallic manis are the bees knees !! I usually don’t bother with combos. Love this though. GLITTER! LOVE the shine and glitter! Awesome…kind of psychedelic lol…Happy Birthday too!! so gorgeous!!! I love it!! Oh gosh! I LOVE them. That UD colour is gorgeous! Wow I really thought it was OPI Absolutely Alice! Your nails look terrific! My favourite combo is Nails Inc The Serpentine (somewhere between royal and navy blue) with NYC Lights-Camera-Glitter on top. The Nails Inc looked great in the bottle, but was so disappointing on my toes. A sudden brainwave and a top coat of the NYC (silver glitter with the odd larger bit of glitter in blue and lilac) saved the day and was totally fabulous. Not looking forward to taking the stuff off, but hey, a girl has to pay for glamour… And Happy Birthday! thats a lovely combo! And congrats on turning 30!